Empower your field Engineers with our Wireless Advisor mobile application integrated into the GSP application. Send and receive real time updates to your staff in the field via an Android or iPhone smart phone. Or use your Android or iPad tablet to accept and manage your work orders, part orders, service contracts, and driving directions. 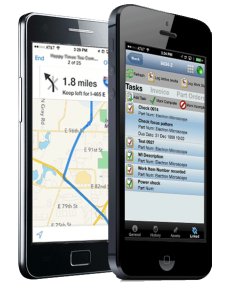 Integrated GPS locations, driving directions, maps, time and material logging, expense management, mileage tracking, notes, parts, Site Asset management, Electronic Signatures, Attachments, photos of site and equipment conditions and more can all be managed on your smartphone. If you happen to lose cell phone coverage for a while, it’s okay because our application will synchronize field data when coverage is obtained.